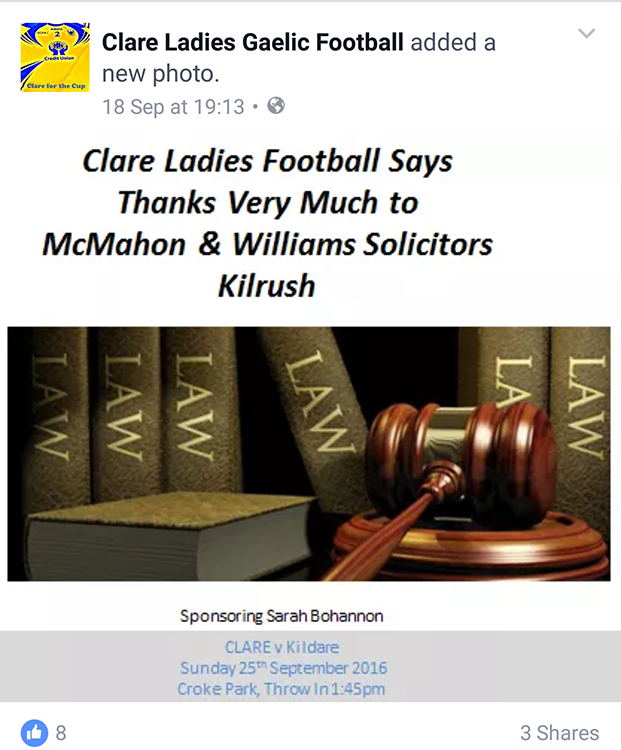 McMahon & Williams Solicitors wish the very best of luck to Clare Ladies Gaelic Football team in the final against Kildare at Croke Park Sunday 25th September. Solicitors Gearoid Williams and Aisling Glynn have successfully completed the Certificate in Decision-Making Capacity & Supported as organised by the Law Society of Ireland. This Certificate was introduced for practitioners following the signing into law of the Assisted Decision-Making (Capacity) Act 2015. The Act 2015 marks a significant development in recognising the legal rights of all persons regardless of disability and deals with the provision of adequate supports to assist people whose decision-making capacity is in question or may shortly be in question. – Presumption of decision making capacity unless the contrary is shown. – Abolition of Wards of Court system and the replacement of that system with the Office of the Public Guardian. – New regime regarding Enduring Powers of Attorney, including provision for healthcare decisions. – Provision of framework for Advance Healthcare Directives. 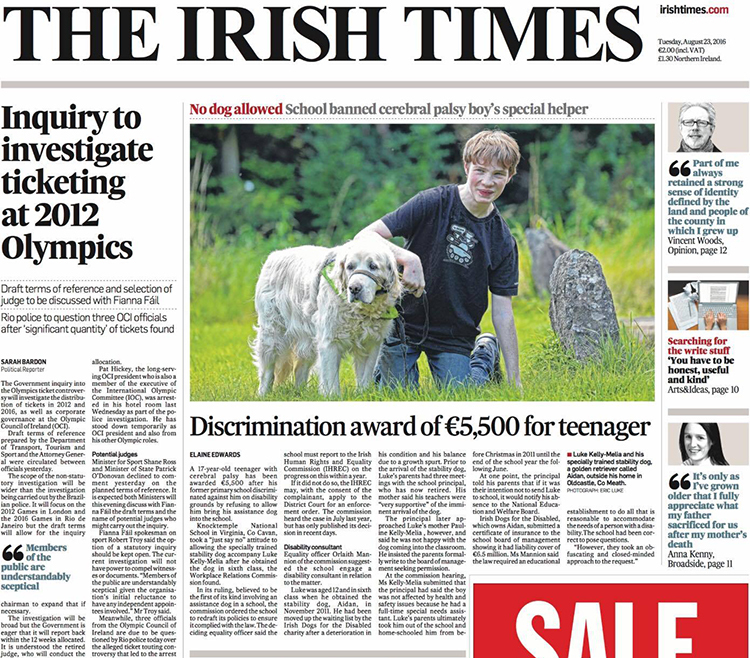 The Workplace Relations Commission has awarded Luke Kelly, 17 year old from Co. Meath damages after his former primary school discriminated against him on disability grounds by refusing to allow him bring his assistance dog to school when he was a sixth class pupil. 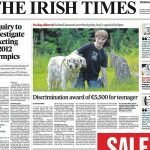 In the ruling, which was the first of its kind involving an assistance dog in a school, the Commission ordered the school to redraft its policies and to report to the Irish Human Rights & Equality Commission (IHREC). Aisling appeared on TV3 news to discuss the case. 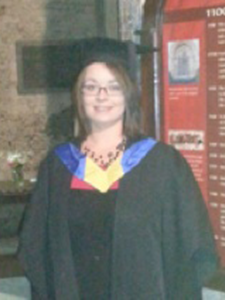 Aisling continued to work throughout the course of the Masters and she graduated with First Class Honours. Aisling specialises in litigation and the Masters has enabled her to pursue her interests in the areas of personal injuries litigation, human rights law and disability law, including mental health law and inclusive education. 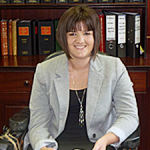 Grace joined McMahon & Williams Solicitors in August 2006. 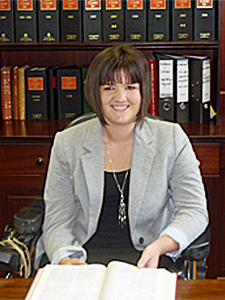 Grace completed a FETAC Level 5 Certificate in Business Law in 2008. 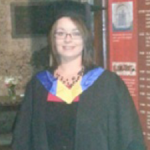 In 2012 Grace began an Advanced Diploma in Legal Studies in Griffith College Limerick and she has successfully completed year one of this intensive three year programme. This Advanced Diploma is aimed at those who wish to gain a full and comprehensive understanding of the Irish legal system, and particularly those wishing to pursue a career in the legal field. The course focuses on the core aspects of Irish Law and the Irish legal system, as recognised by the legal profession. During the course of the year the subjects Grace studied were Sources of Law, The Irish Legal System and Constitutional Law. Grace continued to work full time throughout the course of her studies and she obtained a Certificate with Distinctions in all subjects. 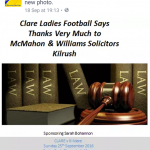 Grace looks forward to continuing the programme during which time she will study subjects including Contract Law, Tort Law, Criminal Law, Company Law and the law as it relates to property in Ireland. The course is awarded by the Institute of Commercial Management (ICM).